Potential lower returns and higher risks expected in the future will require investors to move towards a high conviction approach to find the value left in the markets and potential winners in a changing environment. This will also require the further embracing of factor investing to gain exposure to well rewarded risks while avoiding unrewarding ones. Portfolio construction will also need to adapt to this new environment and to consider multiple scenarios. In doing this, it will be paramount to embrace a flexible approach that goes beyond the traditional boundaries (active vs passive, liquid vs illiquid, benchmark constrained allocations). In this regard, an ongoing dialogue with investors will be key in order to understand and address their evolving needs. The ability to provide greater transparency, effective tools and services will also be increasingly relevant in order to pursue the best opportunities while mitigating risk. As structural trends take place, different long term economic scenarios emerge that will require investors to rethink their investment strategies. In this new world, equities could be less risky than previously thought, Emerging Markets should gain a relevant role in the core allocation, while bond investing will need to be flexible in the search for opportunities across the liquidity continuum. The current environment of synchronised global growth, supportive liquidity conditions, and benign inflation looks set to evolve as multiple interconnected megatrends are driving major regime shifts in long-term economic scenarios. After years of an extraordinary bull market driven by exceptional central banks liquidity injections, we believe that investors are now at a crossroads. On the economic side, while growth is now solid and widespread, the cyclical recovery cannot mask underlying persistent weaknesses and ongoing disruptive trends that are reconfiguring global economic equilibria. In our view, five major megatrends are at play and their evolution will impact the long-term economic and investment landscapes. Globally, longer life expectancy and lower birth rates are translating into a worsening in the ratio of workers to the elderly, which is reaching dramatic levels in developed markets (DM). This trend is also affecting some emerging markets (EM), such as Brazil, China and South Korea, where this demographic ratio is deteriorating. How this trend will further develop will depend not only on the aging trend per se, but also on the changes in the labour force participation rate (which has declined since ‘00 in the US, while it has risen in some European economies). These dynamics will likely evolve further, but at different speeds in the various regions, and as a consequence of policy actions as well. However, evaluating how the demographic shift will impact the global economy and the investment landscape is not straightforward. In fact, aging usually leads to lower growth potential and hence lower rates. However, the relationship between aging and interest rates may not be so obvious, as demographics will also push savings lower and potentially below investments, resulting in upward pressures on rates. Inflation may also potentially rise as the young and elderly population are more inflationary in nature compared to the deflationary features of the working age population1. A second major megatrend in the global economy is the debt mountain, that has continued to pile up after the Great Financial Crisis (GFC), with global debt hitting a new record of US$226tn in 2Q17. While it is encouraging to see that in terms of the debt/GDP ratio there has been a stabilisation over the last year, helped by a synchronisation in global growth, it is also worth noting that the financial sector has been the only segment to deleverage since 2007.
over 75% of global debt growth, mainly due to the rise in US government debt – that added US$11tn of debt in the 2006- 16 period – and China’s non-financial corporations which saw a US$14.4tn rise in debt in the same decade2. For the future, we should expect some deleveraging that could take different forms and with different potential implications on regional and global economies. On the government side, high levels of debt could weigh on future growth and will need to be addressed sooner or later. At a regional level, growth, inflation, rates dynamics, and structural reforms implementation will be key to understanding the evolution of this process (as higher growth, higher inflation and/or lower cost of debt could allow for an improvement in the debt/GDP ratio at the country level). An aging population will be a headwind for developed market economies and for China, where the issue of debt will also need to be addressed in the near future. The transformation of EM economic model from investment-led to domestic consumption-driven could result in the “consumerisation” of the cycle over the long-term, and should therefore allow for more resilience, but more interest rate sensitivity. As a consequence of the growth in real income per capita and urbanisation trends, a powerful EM middle class with new consumer preferences and spending patterns is rising. This group of consumers, together with the group of elderly and retiring people in the developed world, will account for most of the future expected consumer growth, especially in large cities. 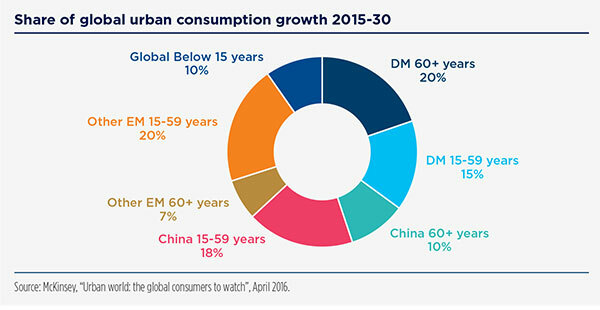 China’s urban consumers alone are set to contribute to 28% of global urban consumption growth by 2030, with China’s working population adding 100 million people that should double their per-capita consumption3. dependent on DM economic growth and monetary policy evolution. In the meantime, a strong focus should be placed on assessing each EM economic development path and their vulnerabilities in this transition towards a new economic model. New technologies, such as robots or artificial intelligence, can improve the speed at which goods are produced and lower the overall cost of goods and services. Innovation and automation also have different impacts on jobs depending on their required skill levels. Even if this trend causes social tension and shifts in employment in the shortterm, automation also represents an opportunity, as it can provide a strong boost to productivity and global GDP growth over the medium-term. The potential acceleration in productivity growth from innovation may partially offset the negative effects that demographic trends could have on the global economy. This is particularly relevant for aging countries which need to replace the losses in the workforce with higher productivity growth. In fact, as previously reported, the workforce population will shrink dramatically in the future and will not be able to maintain the level of GDP per capita unless there is an acceleration in productivity growth. 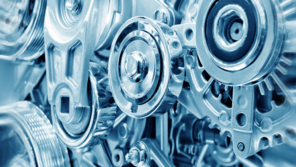 Overall, this trend is expected to impact jobs, inflation and growth, and also to be highly interconnected with the demographic shifts and with developments in EMs. In fact, as wages start to rise in EM countries (such as in China) and robots get cheaper, there will be an increased pressure on EMs to move towards a more skilled and diversified model while other countries could see a repatriation of offshored manufacturing activity, i.e., no cheap labour available abroad anymore. Digitalisation (de-materialisation of physical products or services), sharing economy (based on online tools to facilitate consumer-to-consumer transactions, such as car sharing, home sharing, park sharing) and an increasing focus on social responsibility themes (climate change, responsible use of resources like food, energy and water) are all trends driven by the evolution of consumer/investors behaviour. We believe that these new dynamics will have macro and micro economic consequences. From a macro perspective, they will make it harder to assess traditional economic indicators, such as GDP, inflation, productivity and employment. For example, the sharing economy is challenging traditional economic measurements4. On the micro side, these trends could generate business model disruptions, not only in the most innovative sectors, but also in the traditional ones, such as transportation, trade, real estate, energy. Consumption of products and services from socially/environmentally5 responsible companies is another clear trend, more evident in millennials but fast growing also in other age cohorts5. The greater sensitivity towards environmental, social and governance (ESG) themes is also reflected in the recent growth in ESG investing, which counted for US$22.9tn in assets in 20166 with 25% growth over two years, driven by greater investor appetite and an increasingly supportive regulation. We believe that this growth will continue and will be a powerful force to direct investments towards a more inclusive and sustainable economic environment. 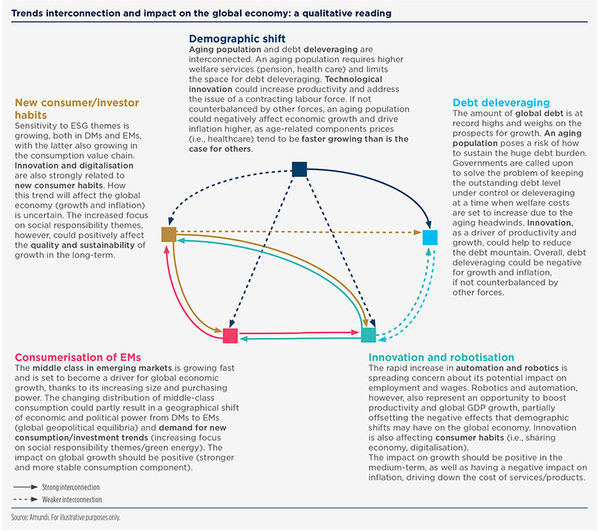 DM should face lower growth potential due to aging populations and debt, which could be partially counterbalanced by a rise in EM economic power, possible productivity gains driven by technological innovation, or new consumer trends. We believe that all the trends presented in the previous pages are strongly interconnected and should be analysed for their cross implications on the economic outlook and global geopolitical equilibria. For example, the demographic shift and the consumerisation of EMs could increase the economic power of EMs, changing the geopolitical equilibria in the process. On the other hand, an aging population in DMs is shifting electoral power towards the elderly, increasing intergenerational inequalities further. Innovation and robotisation could in part help to address the issue of aging populations, but these dynamics can create social tensions in the shortterm. These trends, combined with the increasing economic power of EMs, could also potentially lead to a rise in protectionism (as we are already seeing in the rhetoric of US President Trump and the overall increase in the number of WTO trade restrictive measures, from 464 in 2010 to 2,238 in 20167). If this rise continues, it could have a global impact on the economy, in particular in the form of a slowdown in global trade and misallocation of resources. Being able to assess the evolution of these connections will be critical, in our view, to addressing investment challenges and opportunities in the future. In fact, the ways in which these trends will evolve, may have profound different implications on the future economic landscape and financial market paradigms, as shown in the following pages. As structural trends take place, one of three different long-term economic scenarios may emerge: a great moderation of low growth, low inflation and low volatility; a back to the ’70s scenario of higher inflation; a boom and bust scenario as in the ’90s. We believe this is a transition phase that will eventually result in a shift towards a new financial regime. Understanding which scenario will prevail requires an assessment of the structural trends that we have discussed in the previous chapter and an assessment on how monetary and fiscal policies will evolve, as these could be major forces in designing the future landscape. In our view, there are three possible long-term scenarios that could require investors to rethink their investment strategies. Scenario: this would be the most benign scenario, characterised by an extension of the business cycle, a new Goldilocks regime of low but decent growth and low inflation, where central banks (CBs) slowly remove monetary accommodation. A self-sustained and inclusive growth would gain traction supported by innovation, investments and internal demand (also in EMs) and would assist in reducing the debt mountain and cutting inequalities. While there are signs of this scenario, we think that there are still some risks on the road towards this great moderation, making it less likely in the long run. The changes in CBs’ monetary policies will be the first area of risk, as the occur at a time when some EMs are still vulnerable and markets are highly complacent. Implication for investments: this scenario should lead to lower interest rates at equilibrium, which would translate into a new regime in which high valuations on risk assets would be more sustainable. Volatility under this scenario should be structurally low, meaning that the current (ex-ante) risk assumption could be overestimating the future risk (assuming a mean reversion of volatility towards historical averages) and this could further inflate asset prices with the possibility of generating a bubble in the long-term. Nevertheless, we do not think that a low volatility regime is sustainable and sooner or later we would expect a resurgence in volatility, especially if the markets started to price in a possible evolution towards more negative scenarios (such as creation of a bubble). Overall, the great moderation regime would be mildly positive for risk assets, but with significant differences between winners and losers as the market will no longer be driven by excess liquidity induced by CBs. Focus on fundamentals (earnings growth and credit quality) would become relevant, as well as selection in EMs and allocation to less interest rate-sensitive factors. The impact would be slightly negative on rates, but with no major disruption (slow rise in rates and yields). Scenario: this would be a scenario of debt monetisation as a way out of the debt issue. The monetisation of debt under this hypothesis would occur through higher inflation from wages vs profits, goods and services potentially driven by protectionism (tariffs on imports, barriers to capital/goods/people). In this scenario, CBs would remain behind the curve as inflation starts to surprise on the upside, posing the dilemma to CBs on how sustainable the new inflation regime would be and how quickly the tightening should happen. Implication for investments: this scenario would be challenging for all asset classes in terms of real returns. Equities could suffer from low profit growth due to higher wages and rising interest rates. Equities and bonds could return to a low correlation dynamic. With rising rates, bond yields would move upwards, putting pressure on the whole fixed income space and on EMs, especially in the initial phase. The only assets that could deliver positive real returns would be gold and, more broadly, commodities. Scenario: this would be a scenario of re-liberalisation/de-regulation in an environment of still low rates and economic growth, which may cause a further increase in the overall leverage in the system (and private debt), to inflate asset prices, and result in a new bubble/bust scenario, leading to a new deflationary economic phase. 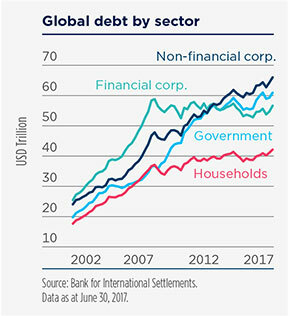 As we have seen, global debt has continued to pile up and it is increasing further, mainly in China’s corporations, but also in the US. We do not think these areas are currently at risk of a bubble, but they need to be carefully monitored as we move towards a so- called “normalisation” in monetary policy. Implication for investments: while most risk assets should benefit in a boom phase, a bubble burst will cause extreme disruption in financial markets, a deep economic recession, and will end up being deflationary. Depending on the level of rates when the bubble bursts, government bonds and other perceived safe assets, such as gold, could benefit and could provide some protection to the downside. The probability of occurrence of any of these three scenarios will change over time depending on how the prevailing trends will evolve and therefore it will be key to monitor the evolution of the major macro variables to recognise the inflection points that could trigger a regime shift. We believe there could be three possible scenarios which will drive financial assets in the next few years. Being able to identify and monitor the evolution which underpins these scenarios will be crucial to building a resilient investment strategy. The implications for financial markets could be meaningful, as they are already vulnerable due to the many consensus trades in the market. In fact, credit spread compression has been impressive across the entire global fixed income universe. Government bond yields remain close to historical lows, with an increasing disconnect with the real economy, which is finally showing signs of more robust and widespread recovery, but with weak inflation pressure. Equity markets are at all-time highs, with some areas of overvaluation emerging (namely, some areas of the US market). All the aforementioned conditions expose investors to an asymmetric distribution of returns with limited gains (due to the lower expected returns) and greater potential losses (due to high valuations and the increased risk of tail events). The ETF-isation of the market (with a high concentration of risk in an index and in big/giant names, and the possibility of fast outflows in case of changes in market sentiment), combined with reduced market liquidity and more restrictive regulation, could further exacerbate the asymmetry of returns. For the coming years, we expect lower returns from traditional asset classes and a higher risks of short term negative performance. This scenario will require investors to rethink how to generate extra performance within each asset class and how to build a portfolio resilient to downside risks. Over the next decade, we believe that returns from traditional asset classes will change dramatically compared to the past. The return for a global balanced portfolio (50% invested in global aggregate bond and 50% in global equity) could drop from the annualised 8%8 recorded after the GFC to an estimated 4.5%, assuming an average 2% dividend yield, 5% earnings growth and 2% of bond yield to maturity, and keeping Price to Earnings ratio (P/E) unchanged. To do that, we believe that investors can enjoy multiple sources of potential extra performance, such as: access to opportunities across all the liquidity spectrum, factor investing, alpha9 generation, in particular in markets that are still inefficient (such as EM, Japan or small-mid cap companies), and by exploiting the potential of long-term growth themes as well. The inclusion of ESG as a risk factor will also be paramount, in our view. ESG investing could allow investors to both reduce risks that are not negligible, such as carbon risk11, and identify long-term opportunities that could best address the challenges raised by new regulations, and consumer and investor habits. In addition to searching for new sources of returns, investors should also consider how best to optimise portfolio construction to manage future changes in the risk environment. Alongside the lower expected returns, we also see increasing sources of risk that could potentially lead to higher volatility (see volatility fertilizers box) and losses that at some point could trigger strong negative reactions from loss-averse investors. Bonds are usually considered less risky than equities. Yet, still low rates and solid earnings growth make equity valuations more attractive, while government bond risk is higher due to the high index duration, and credit could also have lower potential to absorb rises in interest rates, given tightening spread levels. The first investment paradigm is about the overall redesign of the portfolio construction around a new risk framework and with a multi-scenarios approach. In our view, investors should reconsider the traditional risk/return framework, taking into consideration the new emerging risk profiles of the different asset classes and their risk factor exposures to the different scenarios. bonds appear riskier than in the past, as the index duration is at all-time highs and the low level of coupons in certain areas of the market may not be sufficient to absorb even small rises in interest rates. This is a substantial difference from what happened in other bear bond market episodes (’60s and ’90s), where coupon acted as a partial shock absorber, limiting portfolio losses. On the other side, structurally low levels of interest rates, combined with solid earnings growth, make equity valuations more sustainable in the long-term. Overall, this translates into a change in the efficient frontier (shifting down and steepening as a result of a worsening outlook for government bonds and lower expected returns) that requires a reassessment of strategic asset allocation, which could otherwise be suboptimal in this new environment. 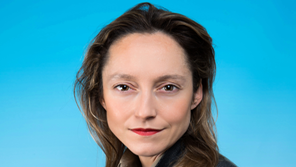 A barbell allocation to cash (as a risk-free safe asset to manage the portfolio liquidity profile and to address tactical opportunities) and to risk/growth opportunities could help to maximise return potential and manage the portfolio liquidity profile, as the risk/return profile of core government bonds looks highly unattractive. In defining their risk allocation, investors should consider that the so-called “risky” assets (especially equities) could be less risky than previously thought. This allocation should also on exposure to factors that could best benefit in the different scenarios (i.e., growth or inflation vs interest rates). In this view, equities could be considered less risky than credit. Credit markets – the great winners in the search for yield led by CBs – are progressively showing asymmetric risk: default rates are close to zero, credit fundamentals are deteriorating (especially in the lowergrade ratings) and the end of excessive monetary policy could put pressure on the asset class as liquidity could suddenly dry up. To enhance yields, potential bond investors should look for opportunities across the full credit space. For example, appealing yields are still available in the EM space, but this area also requires a careful assessment to avoid securities most exposed to rising rates and/or default risk, pointing to the need for a stronger focus on selection. The last important allocation investors should consider is to diversifiers: mainly liquid alternatives or illiquid real assets. 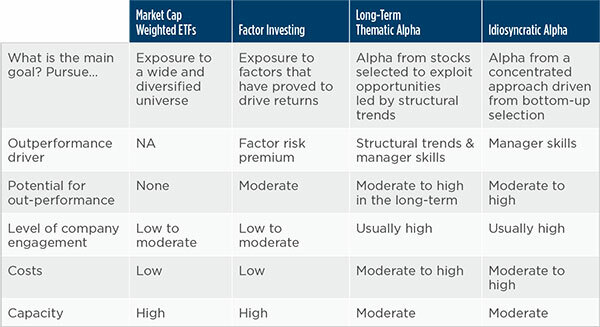 This could help to enhance portfolio diversification and return potential by capturing the idiosyncratic alpha thanks to the manager skills or the liquidity premium. However, to avoid to pile up risk, allocation to alternatives should be strongly focused on manager selection and should consider the different risk factors that these assets are exposed to (i.e., interest rates and yields for real estate, infrastructure and private debt or growth for private equity). The traditional risk/return framework of asset classes will change as a consequence of paradigm shifts. In the future, the combination of low-cost market exposure with factor investing and idiosyncratic alpha from active management will be key to exploiting market opportunities, manage downside risk, and design equity investment solutions tailored around investor needs. Equities are set to be among the most relevant sources of performance in the future for a balanced portfolio, although they could deliver lower returns compared to the past decade. 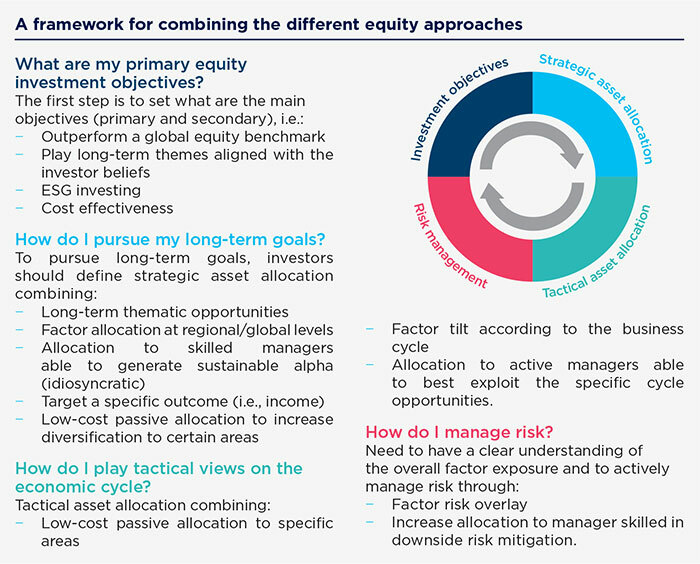 To address this challenge, we believe that investors should try to exploit all the opportunities available in the various scenarios, relying on all the different equity investing approaches at their disposal (see table below). In a great moderation regime, where synchronised global growth continues, we see a continuation in earnings growth in all major regions that still supports some directional views on equity markets, in particular where fiscal policy changes can provide a further boost to be played both through an active management approach (to select stocks most benefiting from these changes) and with cost effective instruments to quickly adapt to changing conditions. As the regime shift eventually starts to materialise, active management could find more fertile ground—for instance, by selecting those stocks likely to benefit in a rising rates environment and in case of inflation surprises, should a back to ’70s risk scenario emerge. Factor investing will also be increasingly relevant in order to gain exposure to well remunerated factors, to avoid the factors that will remain unrewarded, and to approach new factors, such as ESG. In our view, ESG investing will play a relevant role in avoiding areas of risk and in identifying long-term opportunities with a discrete probability of occurrence, also benefiting from increasing investor appetite. Based on their different priorities, investors can embrace different approaches to exploit market opportunities that the regime shift will offer while also mitigating possible phases of downside. Investors will need to look beyond traditional boundaries also in the fixed income space, uncovering assets with bond features and equity-like returns. A flexible approach to fixed income is recommended to mitigate interest rate risk and play tactical opportunities that changing CB monetary policies will create. The third investment paradigm is about the redesign of fixed income investing. While in the past investors have handled the fixed income market with a building block approach to the different segments, we believe that a flexible multi-sector approach able to exploit opportunities across the full credit spectrum and liquidity continuum will be needed in the future. 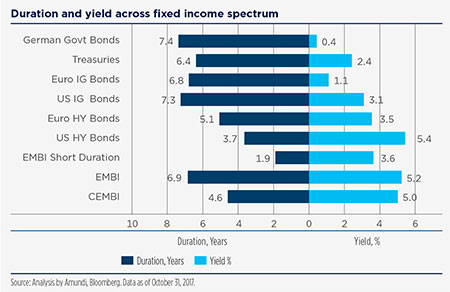 With yields now at historical lows and risk piling up in the fixed income market, the bond component should be shaped around three main guidelines in order to enhance the risk/return profile of a pure fixed income or of a balanced portfolio. Central Banks have distorted government bond markets in developed countries after the Great Financial Crisis. Duration in bond indexes is at an all-time high and overall debt is higher than ever. For bonds, we are not expecting rates to grow rapidly and be significantly higher than current levels, and we reiterate our view of low interest rates at equilibrium (the Fed’s recent downward revision of the terminal rate, because of demographic factors and lower productivity, is supporting this view). However, we believe that with stronger economic growth and inflation closer to CB targets, CBs will find themselves offside and behind the curve. This could mean a scenario of rising rates, with possible sudden rises in yields (a scenario similar to 1994 cannot be ruled out) and significant capital losses for investors in a framework of reduced liquidity and lower cushion provided by coupons. However, this spike in yields could be temporary, as at the same time, structural trends, such as demographics (although questionable), regulation and excess of savings with a bias for safe assets (more and more scarce), should continue to keep yields low. In addition, the risk of a US cyclical downturn in growth in the medium-term (18/24 months) remains and could start to kick in as soon as the business cycle becomes mature. In this tug of war between upside and downside forces on interest rates, duration management will be crucial. If we add different speeds in normalisation of monetary policies to this scenario (US in a more advanced phase than the Euro zone and Japan), we could see yield curve movements offering opportunities for flexible management in curve buckets (steepening/flattening), cross country spreads (i.e., Treasury vs Bund) and currency exposure. The bond component has to be redesigned in order to meet new investor demands, to mitigate interest rate risk, and to enhance the low expected returns from government and high-grade corporate bonds. A growing focus on transparency and corporate governance as well as a new stage of development in EM will drive capital allocation towards EM assets. As many economies are at different stages of development, a selective approach is recommended when building EM exposure.. In our view, EMs are a long-term opportunity and investors should structurally increase their weight in the portfolios. In fact, for example the EM equity asset class is still underrepresented in investors’ portfolios (5% of average equity allocation in institutional portfolios vs 12% of EM market cap on world market cap, and a 58% share of GDP)12 with room to grow. We base our conviction on a combination of short- and long-term trends. On a tactical basis, EM asset classes are well supported by stronger and synchronised global growth, a stabilisation of the commodity cycle, and easing financial conditions. In many situations, looking at risk premia in both the equity and debt spaces, investors are still well rewarded for the risk of further depreciation of currencies. On a structural basis, we see progress thanks to ongoing structural reforms (digitalisation, urbanisation and liberalisation of financial markets), which should in turn help the transition of the economic model of many EMs from export/ investment-led to internal demand-driven model (more sustainable). 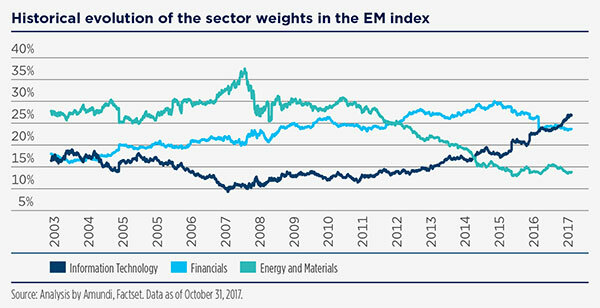 This transition is already reflected in the falling weight of old economy sectors (energy and material) in EM equity indices, counterbalanced by new economy themes (IT). In our view, these trends will drive a structural catch-up of EM investing vs DM, but some areas of risk will remain. A key area to watch on a structural basis will be the resilience of the Chinese backdrop and the ability to manage the economic transition, the currency credibility and the management of the debt issue without major disruption. All the previous developments clearly point to the need to remap the EM universe, going beyond geographical frontiers and focusing on macro drivers and vulnerabilities for each country. In fact, countries are at different stages in the transformation process, with different stability conditions (i.e., reserves, current account) as well as varying levels of room for manoeuvre in terms of fiscal and monetary policies, electoral cycles and reform impulses. This makes us more comfortable in approaching EMs on a selective basis, focusing on a combination of top-down analysis at the single country level with a bottom-up focus at security level. In our view, the ability to approach EM investing in an integrated way (bond and equity) will also become a distinctive factor in order to understand full capital structure of companies and to address macro and micro dynamics, both relevant when assessing EMs. Approaching EM investing in an integrated manner (bond and equity) is an important factor, as it helps to understand the full capital structure of companies. 1-Source: BIS Working Papers, “Demographics will reverse three multi-decade global trends”, by C. Goodhart and M. Pradhan, August 2017. 2-Source: IMF Global Financial Stability Report, October 2017. 3-Source: Amundi calculation on data from McKinsey & Co at April 2016. According to McKinsey, “91% of global consumption growth will be generated by people living in cities from 2015-30”. 4-Federal Reserve Bank of Kansas City, April 2017, Waiting for a Pickup: GDP and SharingEconomy. 5-The Nielsen Global Survey of Corporate Social Responsibility and Sustainability, 2015. 6Global Sustainable Investment Review, 2016. 7-World Trade Organization (WTO), as at October 2016. 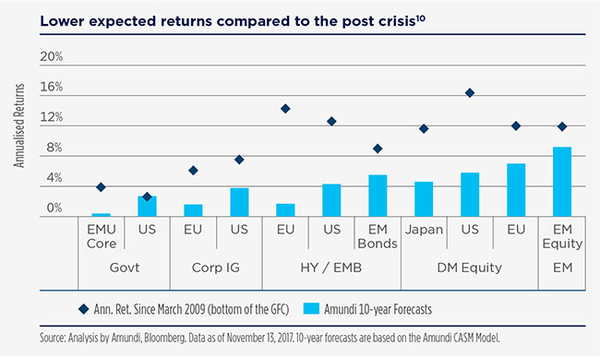 8-Amundi analysis on the annualized return over the period from 31 March 2009 to 31 October 2017 of a 50% MSCI AC World Net Total Return Index and 50% Bloomberg Barclays Global-Aggregate Total Return Index. Nominal returns before fees and taxes. 9-Alpha measures risk-adjusted performance, representing excess return relative to the return of the benchmark. A positive alpha suggests risk-adjusted value added by the manager versus the index. 10-Source: Amundi analysis on Bloomberg data and Amundi forecasts. EMU Core Govt = JPMorgan GBI Germany; US Govt = JPMorgan US; EU Corp, US Corp, EU HY and US HY are BofA Merrill Lynch indexes, all equity indexes are MSCI. All indexes are TR. Nominal returns before fees and taxes. Past performance is no guarantee of future results. 11-Financial risk related to the companies carbon footprint and carbon exposure. 12-Mercer European Asset Allocation Survey on European pension funds industry, 2017. 13-The Amundi EM Vulnerability Index takes into account: CA and Funding; External Debt and ST External Debt; Reserve Adequacy; Domestic variables. 2018 is a global turning point! The risk is a disruptive move! The beginning of the year was characterised by a slight rise in long-term yields and outperformance of risky assets. 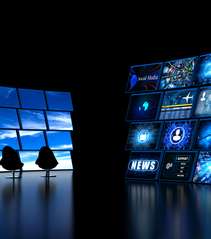 Disruption 2.0: Advertising wobbles have reignited structural concerns in the media sector - Break point? 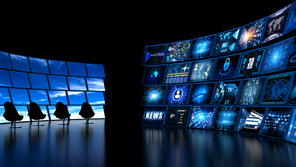 Weaker ad trends in the US and Europe despite a solid macro backdrop have reignited structural concerns, causing agencies and TV stocks to underperform over the last recent months.